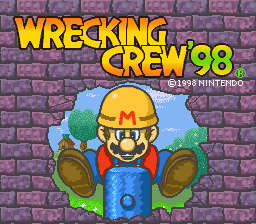 Wrecking Crew '98 is a Japan-only sequel to Wrecking Crew, which also includes said game as a bonus. The following text is found at 40 in an unheadered ROM. Narumi Nakashima is credited as Chief Designer. This page was last modified on 13 September 2015, at 20:54.